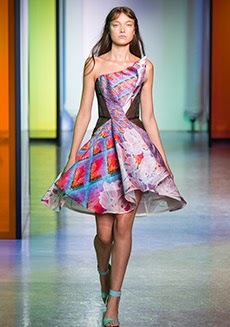 Peter Pilotto's designs caught my eye over a year ago. His dresses are always unique, both in color, pattern and style. Therefore it comes as no surprise that Target would commission it as the next brand to be featured in their affordable exclusive designer collection, set to launch tomorrow, Feb 9th. This time the pieces can be found not only at Target but also Net-a-porter. Since Target designer exclusives usually sell out within minutes, it may be nice to have a second option on where to buy. Preview the Target collection by clicking here! Peter Pilotto and Christopher De Vos are the designers behind the label. They met while studying at Antwerp's Royal Academy of Fine Arts in 2000. Pilotto focuses on the textiles and prints, while Vos concentrates on the silhouette and drape. The two work together to create interesting and lovely creations! It is currently sold in 50 countries worldwide at over 220 high end retailers including Selfridges in London, Le Bon Marche in Paris, Bergdorf and Saks Fifth Avenue in New York and Joyce and Lane Crawford in Hong Kong and China. Find this skirt by clicking HERE! Love the pattern and drape of this dress! The bottom of this dress looks very fairy tale-esque!